I’ve had quite a fruitful few weeks from the garden (if you’ll pardon the pun). Life has been quite busy but I find that I’m starting to weave gardening into my everyday life. I do a tiny bit of weeding every morning whilst I’m cooking breakfast, and then in the evenings I do any tying in etc before I water the garden once GarlicBoy has gone to bed. And then a couple of times a week whilst he has his lunchtime nap I do the slightly heavier tasks, cutting the grass and planting things out etc. It’s really lovely and I think I’ve been a much happier person since I started gardening again. 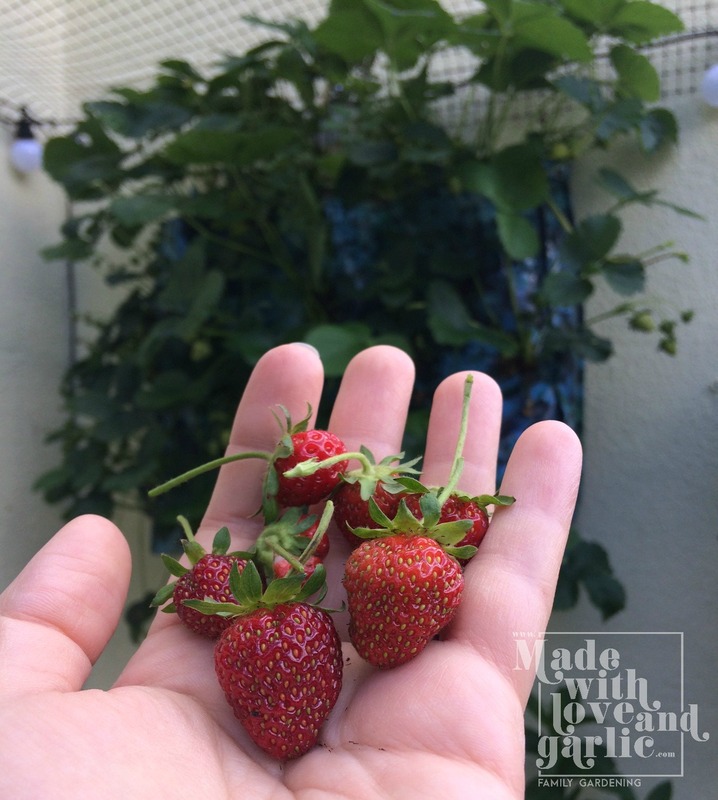 I absolutely love having GarlicBoy help me harvest things too, he’s such a happy little chap and gets so excited whenever there’s a new ripe strawberry or similar to take in with him. I’m now cooking at least a couple of meals a week with garden produce that I’ve grown myself and that’s very satisfying. I’ve updated my garden produce harvest records and I’m really pleased with how I’m doing. I’ve had about a punnet of strawberries so far (albeit one at a time) and huge amounts of spinach, parsley, mint and rosemary. 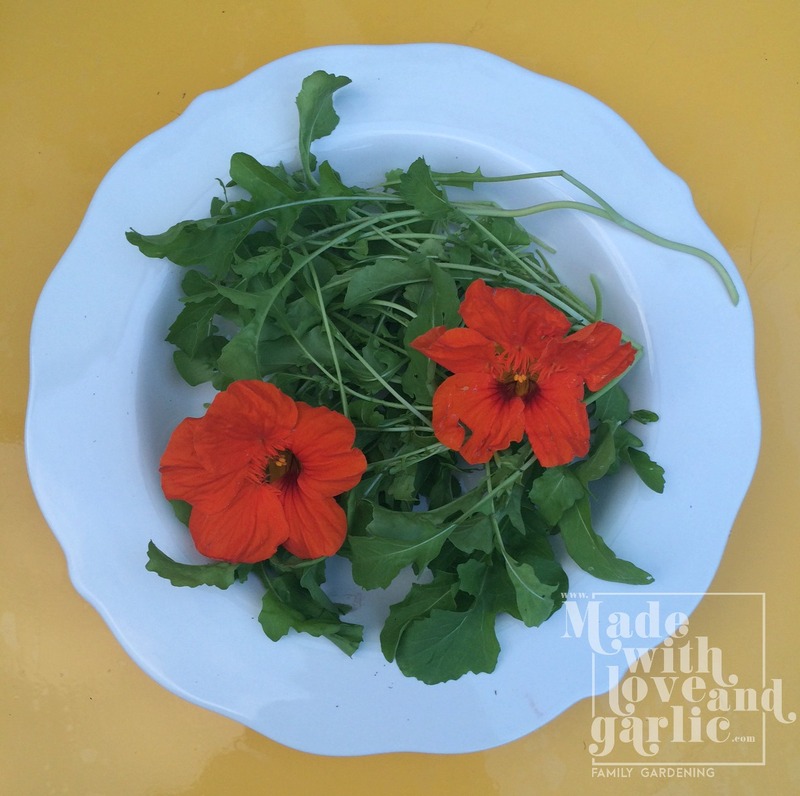 We’ve also started regularly eating the nasturtiums and rocket. Once we start to get crops of things like courgettes and tomatoes I expect that we’ll be saving a bit more money but for now I’m just so thrilled at what we do have. The taste of fruit and vegetables taken fresh from the garden literally minutes before eating is beyond compare. I’ve actually always disliked rocket and found it overly bitter but the taste of the rocket from the garden was so amazingly fresh and fragrant that I find myself wishing that we had much more space for me to grow leaves in!